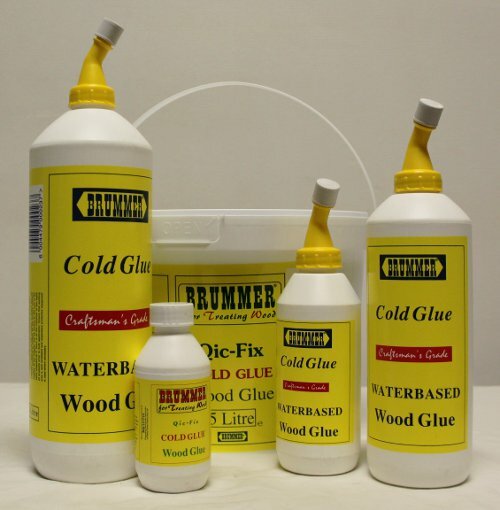 BRUMMER COLD GLUE is a wood glue of medium viscosity having excellent wet tack combined with good open time. The adhesive dries semi-transparent and is hardly noticeable on light coloured woods. It is easily sanded without softening. The adhesive is supplied in a ready to use form and should be used without dilution. It may be used in industrial production for gluing dowels, joints, tendons, solid wood, laminated boards and general furniture manufacturing yielding a creep resistant bond of good strength. When the adhesive is used for laminating, it should be applied evenly to one surface at about 150g/sq.m. The surfaces should be joined and pressed at about 2-3kg/sq.cm. for 30 min. When hot pressing do not exceed 120°C. Press time should be 45 minutes. Any excess adhesive due to squeeze out should be removed whilst wet. Tools and brushes should be cleaned immediately with water. Since wood gluing is highly dependent on the type of wood, density, grain structure, porosity, moisture content, as well as ambient climate conditions, the adhesive should be evaluated under operating conditions and the above guidelines are only offered as a basis for evaluating. E.g. greater wood porosity will necessitate increasing the quantity of adhesive applied to the joint whilst denser timber would require increasing the clamping pressures. DISCLAIMER: seller makes not warranty, express or implied, concerning the product merchantability or fitness thereof for any purpose, except that the product does not infringe any valid patent. No claim of any kind shall be greater in amount than the purchase price of the quantity of the product in respect of which consequential damages, whether Buyer's claim is based on contract, breach of warranty, negligence or otherwise. Onus is on the customer to ensure that the product purchased is suitable for the purpose intended, and to test apply all products prior to bulk application. All content © Brummer Adhesives SA (Pty) Ltd. All rights reserved.